Magazines at various times have articles which suggest there are random things to do before you die/reach 50 etc. 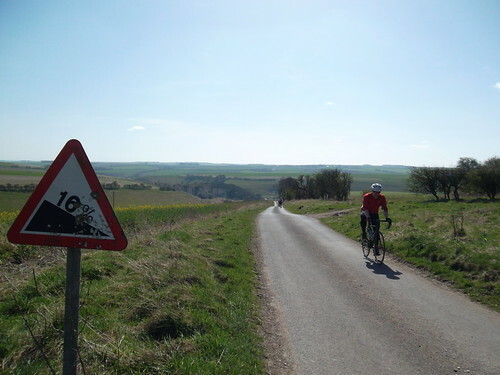 I have completed quite a few of the tasks that often appear (both legal and illegal) but one goal, which up to April 1st 2012 had eluded me, was to cycle 100 miles in a day. I came close last summer with an 89, but convinced I would get the chance to beat it another week I stopped. However, bad weather and sick children meant I didn’t get the chance to turn three figures on the bike computer in 2011. Chris had said he was leading the CTC 'B' group ride (appropriately Fool’s Day?) on April 1st to Malton and that it would be a good chance to break my one hundred mile duck, so I said that I would be there. I had planned for my normal café run on a Saturday as a ‘leg loosener’ but my ride partner was suffering from a large thumbprint on his head that his wife had left, so I went into Sunday morning a tad flat. Despite Look North’s Dolly Daydream Weather Girl saying the weekend would be a washout weather wise it was bright at 7.00am but there was a light frost on the car windscreen. This brought the first dilemma of the day – tights or shorts? I then remembered I had stashed a secret purchase of leg warmers in the cupboard (I had promised my wife that I had all the cycling kit I needed) – so I put my shorts on and snuck downstairs to put the leg warmers on. Five minutes were wasted trying to decide whether they should go under or over shorts. Chris had sent me a copy of the route, but I had neglected to study it. I had imagined there would be a few ‘lumpy bits’ so I decided not to leave South Cave by the steep Beverley Road but went the flatter way via Welton. By avoiding the hill it meant my journey to Cottingham was a few extra miles but stupidly I hadn’t taken this into account when factoring in getting to the start for 9 o’clock. I was tempted to give Chris a ring and say I was running a bit late but my phone is wedged into a cycling wallet (another recent purchase) and it takes a while to prise it out. Luckily at this point I was being overtaken by cyclists participating in a triathlon – so I quickened my pace to keep in touch with them and made it on time. The first thing I noticed at the start point was Chris’s shiny new road bike. That would make two of us on ‘racers’ and no mudguards. At a shade after nine, seven of us set off hopefully enabling me to reach the promised land of a century. After we had cleared Cottingham, a couple of miles on a main road and we made it onto the ‘B’ road towards Walkington, Chris and I found ourselves at the front of the group and breezed along catching up on news and cycle related purchases. Just after Etton the cry "knock one off" went up as nature called. While we were waiting it was pointed out that we should perhaps slow down a little as this is after all the Cyclists' Touring Club ride. Fair enough. Suitably chastened we set off again, albeit a little slower. My knowledge of local routes and roads is notoriously poor (one of the reasons I hadn’t studied the route as it means nothing to me) and before we got to Market Weighton I felt as though I was in uncharted territory (in fact I had been down the same road on the Wednesday before). Whilst others were talking about the various merits of different ways to and from Malton, I managed to miss a right hand turn (still all these extras were making 100 miles nearer). Our first scheduled stop was the World Peace Café at the Buddhist Retreat in Kilnwick Percy. If today was my first 100 mile ride it was also Chris’s first taste of brown scones (flavoured with date). I plan to do more 100 rides and I’m pretty certain Chris will eat more brown scones. We were not the only cyclists to be outside the café enjoying the by now quite warm sunshine. Other CTC riders were there but were not tempted to join our ride. Chris was apprehensive about the comfort of his new saddle but as he had placed his bike behind my chair I found that as a sunbathing headrest it was more than adequate. 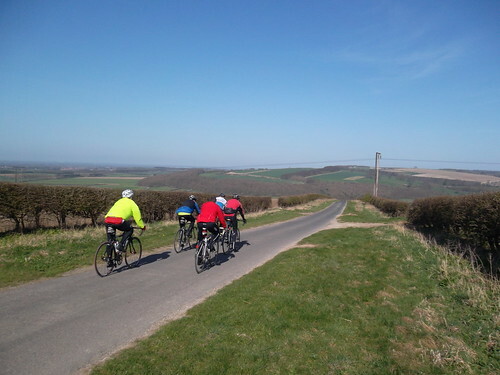 As enjoyable as it was eating cake, drinking coffee and exchanging pleasantries the 100 miles would not ride themselves; so we set off and were soon to be entering a whole new world – well North as opposed to East Yorkshire. We had lost two riders just prior to the café – I can only assume they didn’t have the correct papers to cross over into North Yorkshire. As we entered into North Yorkshire the landscape become both more dramatic and ‘bumpier’. “a cheeky little climb” was anything but an apt description for the hill at Burdale, but the reward was a super view of the route that lay ahead. The back roads were pleasantly virtually free of cars but a couple of times I had some big ‘pings’ as large flint was shot out from under the rear tyre. It was a long and gentle descent into Malton and then the inevitable eating arrangements for those who look forward to trying out local hostelries for eating and those who bring snap with them (carried in imaginative vessels). Myself and Steve went into 'The Yorkshire Tea Rooms' and I had just ordered when Chris burst in the door: “Francis – your tyre has just exploded!” I went outside and saw straight away that the ‘puncture proof’ tyre had ripped (no doubt on one of the ‘pings’), it had done well to hold together until lunch but it was now well and truly ‘holed’. Realising how important it was as we had only done 60 miles I decided to act straight away – well straight after lunch anyway. Suitably replenished and carrying out two refilled water bottles I set about the repair. After changing the inner tube, I could see that it was a decent size rip and in danger of letting further bits of flint or stone in. I attached a thin piece of plastic to the inside of the tyre, a patch on the outside of the tyre, crossed my fingers and hoped for the best! 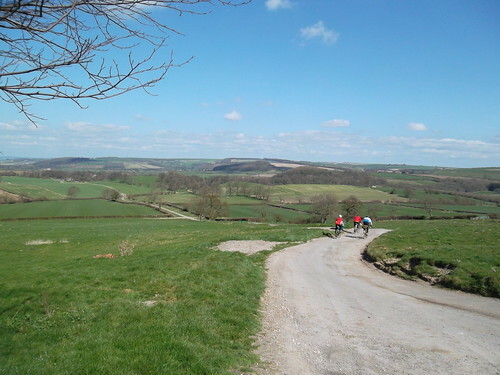 We met up again with Dave and Tom and set off on the return leg on another route through Thixendale. Although it was sunny, I still hadn’t decided it was warm enough to take off my leg warmers, but climbing at Thixendale I decided that the optimum temperature had been reached to wear just shorts. Why I couldn’t wait till the summit I don’t know but I was rolling down the leg warmers whilst battling up the hill. Not stupid enough to try and get them over my shoes – I looked like a monochrome fat extra from 'Fame'. I don’t know if it was the liberating of my legs from cover or the lunch time carbs kicking in but early afternoon was spent 'racing' up hills towards imaginary KOTM finish lines, myself and Chris felt quite good with ourselves until a younger, fitter cyclist burst past the pair of us and asked us why we had slowed down! 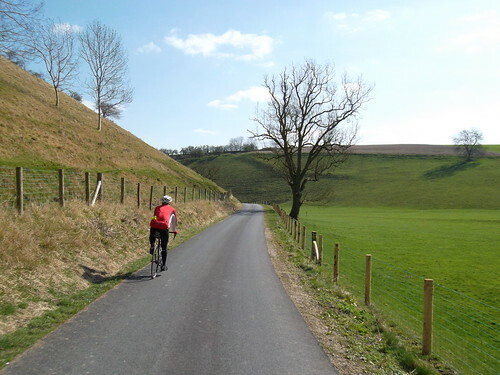 Although I had done quite a few rides last year of around 60 to 70 miles the great thing about this ride was the amount of new lanes I had ventured down in the Yorkshire Wolds (although as I said before I don’t remember previous routes). After covering 80 miles I knew we were closer to home as the roads were definitely familiar. As we came towards Etton, Dave and Steve went into the village and Chris and I went towards Gardham to to make sure I completed ‘the 100’. As we came through Newbald I calculated that I may finish just shy of the mark so a couple of little extensions were added. There was one final stop in North Cave for drinks and for Chris to extinguish the fire from his smoking toes (his shoes are half a size too small but they were a bargain, apparently). As I entered South Cave I was well into the late 90s but going straight home would have been an agonising shortfall. So I decide to ride into Ellerker with Chris and then I would loop back. As we were going along a main road not far from my house I could hear my mobile phone going – I knew it would be my wife inquiring as to my whereabouts so I ignored it; I told her later she could have stood on the back doorstep and seen me cycle past. As Chris turned towards Brantingham I did a loop of Ellerker and then back towards home. Of course by now I was in danger of careering off the road as my eyes were glued to the bike computer: 99.5, 99.6…..
As I sped up the driveway and straight into the garage I was elated to have finally cracked the 100 and walked into the house expecting a round of applause from my loving and supportive family… "YOU'RE LATE!!!" Posted by Francis on April 4th, 2012. Francis wrote: I knew it would be my wife inquiring as to my whereabouts so I ignored it. LOL – that's why you were late. 100 miles is satisfying enough as a total but I imagine you'd have been able to cycle further. 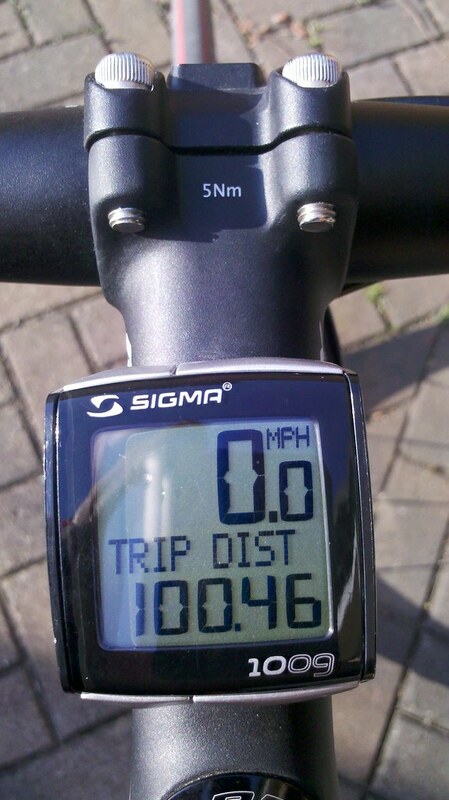 Not knackered in other words, but a century is a good place to stop IMO. The couple I've ridden, the last 20 miles was just for the sake of it, which I suppose means around 80 is my 'happy distance'. Well done Francis. There is something very satisfying about a nice round 100 miles. LOL. If thats the worst you get up to your wife doesn't have too much to worry about! I have heard of people who have secret bikes stached in the shed! Sometimes its handy that non cyclists think one bike looks just like another! Brilliant read Francis, I laughed out loud with your leg warmers from Fame! 🙂 Looking forward to hearing more about the new bike of Chris's. Seems you both have found your legs regarding speeding along nicely. There is something very satisfying watching that digital number flick over from 99.99 to that magic 100 isnt there. I have my GPS in km, so occasionally I get to do this twice on a ride. No 100's for me this year so far though. Wonderful weather you had for a run about. Excellent. "Smoking toes" are a "feature" – every time Chris wears his new shoes he willbe reminded what a bargain they were 🙂 . I did enjoy the ride, though. as with all good tales (harry potter, police acadamy etc) there should always be a sequel. My first audax was last sunday, whilst a relativley short audax 200km it was long enough for me and quite eventful – WATCH THIS SPACE! !